In 1831, Floyd County was established and was named for Governor John Floyd. Governor Floyd was a native the Montgomery County, the parent County of Floyd. Reflecting early and strong commitment to education in the community, the Jacksonville Academy was established in 1846. It served students from Floyd and surrounding counties. The Jacksonville Academy was located in one of the two buildings that is now Schoolhouse Fabrics. Throughout the 19th and 20th centuries, the local economy was dominated by agriculture. Textile manufacturing rose and fell during this time. The construction of the Blue Ridge Parkway during the Great Depression brought some needed work to the County, and more importantly created a linear park and access way to introduce travelers to the arts, crafts and music of Floyd County. Mabry Mill, located in Floyd County, is one of the most visited and photographed sites along the 469-mile length of the Blue Ridge Parkway. The Rocky Knob recreation area along the Parkway also features hiking, camping and panoramic views. By the 1970’s, Floyd County was “discovered” by the back-to-the-landers seeking rural refuge. Many of the new residents were artists or artisans. In Floyd County, they found a land of natural beauty, a unique geography with all waters flowing out, rich hand-craft and music traditions, and open opportunities for creative living. These same assets and the culture of creativity now attract many travelers to Floyd, which has seen a dramatic increase in tourism. According to tradition, present day Floyd County was among the first areas explored when Virginia Colonists began to push into the mountains of Virginia. In the mid-to-late 1600’s, expeditions began to map the area that was then principally a hunting-grounds by Indians, including the Canawhay tribe. The first white settlements in the area occurred in the mid-18th century. By the 1790’s, English, German, French, Scottish and Irish immigrants settled in what is now Floyd County. One of the first industries, Spangler’s Mill, was also established in this time period. 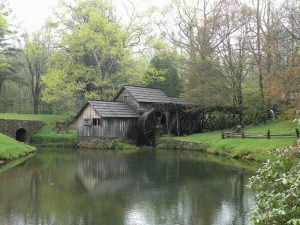 Watermills such as this one continue to symbolize the resourcefulness of residents and the importance of natural resources and living in touch with the land. Land in the southwest portion of the County that was ceded by the Cherokee Nation to the British in 1768 was, in turn, part of the large land grant made to Lighthorse Harry Lee, father of Robert E. Lee and Charles Carter Lee. 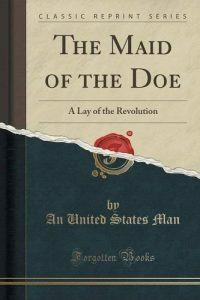 The latter moved to the County and penned what is believed to be the first book written here, The Maid of the Doe. It was a book of poetry about the Revolutionary War. Part of that Lee property, Buffalo Mountain, is now a natural recreation area.